If you don’t already grow variegated Solomon’s Seal in your shade garden, this is the year to start. This charming, visually appealing perennial is similar to hostas, but has its own unique character that will add beauty, texture and interest to your landscape. Furthermore, it is deer-resistant, making it perfect for a yard that may lose a few too many plants to wandering wildlife. Variegated Solomon’s Seal (Polygonatum falcatum ‘Variegatum’) is a low-maintenance plant native to Europe and Asia. A landscaping favorite for its overall beauty and visual richness, it sports 2-3-foot tall gracefully arching, reddish or burgundy stems. The stems are lined with narrow green leaves streaked in pure white. Beneath the stems, in pairs, from late spring to early summer, drip tiny, fragrant, bell-shaped white flowers. In the autumn, small, round, black fruit replaces the flowers and leaves turn golden yellow. Overall, these clumping plants grow 2-3 feet tall and wide, making them a suitable size for many different landscape designs. As clumps grow, they can be divided every 2-3 years in spring to give you even more of these lovely plants to work with, or you can allow the colony to naturalize in your landscape for a lush carpet of foliage and flowers. This plant is quite hardy and is not seriously bothered by either insects or diseases, though snails and slugs can be a problem. Leaf spot and rust are very rare problems and easily overcome with diligent care. These are versatile plants that can do well in any full or part-shade area of your landscape. 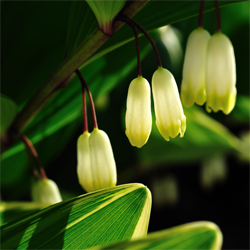 Add Solomon’s Seal to a woodland garden or shady border, or beneath a broad, spreading tree. This is a great plant to anchor rain gardens, because it likes moist soils and is not overly sensitive to too much water. At the same time, it will also tolerate drought and drier soils, making it an ideal addition to add growth and greenery to rock gardens. Variegated Solomon’s Seal can look stunning on its own, or adds even more texture and interest when planted with hostas and ferns or when filling in spaces between other shrubs or ornamental grasses. Plant it in fertile, moist, well-drained soil, preferably in fully shade or only minimal dappled sun. Amend the soil with compost as needed, especially while the plants are young. Water well until the plants are established, then enjoy the beauty as this low-maintenance wonder takes good care of itself.